Enter a chance to win one copy of Bath Tangle by Georgette Heyer (Harlequin, 2009) by leaving a comment stating what intrigues you about the plot or characters, or if you have read it, which is your favorite character or scene by midnight Pacific time, Monday, September 6th, 2010. Winners will be announced on Tuesday, September 7th, 2010. Shipment to continental US and Canadian addresses only. Good luck! Bath Tangle was the last Heyer I read and I enjoyed it, especially Mrs. Floore. Her amusement at the pretenses and foibles of the ton is contagious! I want to read this one SO badly! I lived in England for awhile and Bath is probably my favorite city in the world and I’ll read almost anything set there. However, my library system doesn’t have a copy, and I’ve been dying to get my hands on it! I was just recently in Bath and now look forward to rereading this book and really seeing those places in my head. I always felt that many of the characters in Bath Tangle were more real. Think of the many people we meet on a daily basis and you’re bound to find an Ivo in there somewhere, or a Mrs Floore, or Hector. Bath becomes a character on its own in this book and I’ve always loved that about it. I know that some people didn’t enjoy this one as much, but I really loved it. Serena and Rotherham reminded me a lot of Dexter and Tracy from The Philadelphia Story, which is one of my favorite movies. Actually, the fact that Serena is Hector’s goddess also reminds me of the Philadelphia Story now that I think about it. Hmm. I’ll have to see if I can track down a copy at my library and see what other parallels the two have. I always feel like I should be more fond of this book than I am. The minor characters are delightful but our hero and heroine? Usually Heyer’s characters, for all their faults, are easy to like but I didn’t find that to be the case here. It felt like Heyer couldn’t work up enough interest in them to sketch them as anything other than cliches, although well-scripted ones. This definitely sounds like a gook for me! I love books where the heroine/hero are “at odds with each other from page one”! My fave Bath Heyer is Black Sheep and I don’t re-read this very often … altho certainly Emily’s grandmother is quite marvelous. Captivating review, Deb! The protagonists at odds with each other from the start reminds me of Faro’s Daughter, which I enjoyed tremendously. Your references to Austen and Shakespeare are things I will watch out for. This one is definitely going on my TBR pile. Is it bad that I want to read this because the hero apparently has great hands? Of course the plot itself sounds a delightfully madcap as one would expect from Heyer, but I admit it was the hands that got me. I love the description of the various of characters. 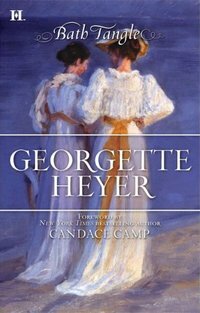 Georgette Heyer has the most interesting, humorous situations in her stories. I look forward to reading Bath Tangle. This wonderful review is the first I’ve heard of Bath Tangle. Recently I’ve read several historical fiction novels in which Bath figures prominently, and so that part of the plot is very appealing. Plus I love the dialog, the cant, lots of characters — and it appears that everything is here. Thanks for the giveaway opportunity. This does sound delightful–I am fascinated by the similarities to other books mentioned in the review (Persuasion, Sense & Sensibility, Taming of the Shrew, etc.). Great review! Bath Tangle sounds like a wonderful book. I especially like the setting (Bath a place I would love to visit), and the characters. They sound like fun characters to read about, especially with the similarities to Persuasion (my favorite Austen novel) and Mansfield Park. I too usually “love books where the heroine/hero are “at odds with each other”, but I’m afraid this is one of the few that has failed to win me, perhaps it is too much dagger-drawing between them. I also tend to like strong heroines, but Serena again seems too much, just like Judith in Regency Buck, she manages to exasperate me in her stubborness. But I agree with Elaine and Deb about Mrs. Floore, she is one of the greatest secondary characters and yes, to me she also reminds me a lot of Mrs. Jennings, they both have a heart of gold so that is why we can overlook many of their vulgarisms. Bath Tangle sounds like a book I want to read as this review mentions my favourite JA novel, Persuasion. While I am not a fan of hero and heroine being at odds from page one, but this one sounds like it has plenty of other story lines in the plot than this just aspect. oh, I did read An accomplished Woman and loved it! The heroine Lydia was a refreshing change from the usual blue stockinged female so much maligned by the Miss Wraxton of The Grand Sophy. BTW, what’s with all the silly Edwardian illustrations on the book covers? This one sounds fantastic! So many plot lines to follow and everyone ending up in Bath! I love the confusion of it all! Thank you for a beautiful review! I’m really anxious to read this one, as I have heard so many wonderful things about it. Your review has bumped it up to a higher spot on the TBR list. Can you imagine? I could get a real picture of one of today’s authors and what they’d come up with on this. Sounds truly romantic and lively. I just ordered An Accomplished Woman by Jude Morgan. I would like to read Bath Tangle and the compare the two novels. The similarities to Persuasion are also appealing, since that is my favorite Austen novel and one of my favorite novels over all. This is one of the books that I liked, not loved. It is amusing and well written, the dialogue is great, but it goes on for a while. I think thats why I love the mysterys. The affairs don’t get quite so tangled and I don’t get quite so impatient with the lovers. Copusin Kate is far from my favorite, it probably ranks on the bottom, but all Heyer’s are worth at least one reading. Okay, the English major in me just geeked out a bit at the fact that you used the term “titian-haired.” Not to mention all the Austen comparisons. Moving on…. I’m always interested in how Heyer (and other authors) portray relationships and friendships outside of romance, and I’m particularly interested in reading about the sisterly bond between Serena and Fanny. This sounds like a fun, if sometimes dizzying, read! I really liked the way Heyer worked through all the ‘tangles’. I found the relationship between Serena and Fanny well-written.